Holisol’s DMS provides features ranging from pickup management, field executive management, vendor mapping, bagging, transport scheduling, delivery management, COD management, COD remittance and scores of other features. Apart from this, DMS (Delivery Management System) offers various features to manage the irregularities & exceptions that the logistics service providers encounter in their typical day to day operations such as weight amendment, RTO, Re-attempt, change consignee address, assigning lost shipment liability etc. DMS enables you to have a real-time communication at multiple levels and make your delivery operations paperless. 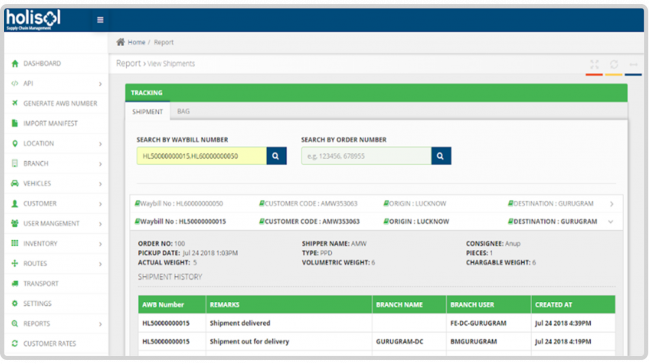 First-mile scheduling and reconciliation of shipments with 3PL. Lack of transparency between the customers and 3PL. Reduced productivity due to navigation problem. Productivity loss due to inaccurate assessment of the manpower cost. Missing real-time visibility in the delivery operations. Mismanaged data points due to Inaccurate user log history.